Home/blog/How long do you want to keep your teeth? The average life expectancy in the US is now 78.8 years old. How long do you want to keep your teeth? Okay, that’s a loaded question. The answer that everyone should give is the same: FOREVER. With today’s knowledge of prevention, and the awareness of the negative effects of tooth loss, every person should have a common goal: to maintain their ability to chew with natural teeth until the end of the road. No, no, no! Edentulism, or tooth loss, is not a natural part of aging. Tooth loss is the ultimate end result of a disease, an oral health disease. And this disease is preventable. Before I tell you how easy it is to keep your teeth, let me first illustrate the realities of tooth loss leading to denture wear. Many people don’t know the truth of what it’s really like to function with dentures instead of your own natural teeth. When teeth are missing, bone loss continues which results in a change in facial support. A sunken appearance can begin to take place as the supporting bone beneath (what used to be your smile) deteriorates. A perfect fit is difficult to accomplish with composite dentures. These hard plastic appliances are pressing against fragile soft tissue that can easily become irritated and inflamed. Think about how uncomfortable ill-fitting shoes are to wear and how sore your feet can get, imagine how this translates to delicate soft tissue and plastic in your mouth? Speaking with dentures varies for people, some only struggle initially. Some people struggle with speech for a long period of time or indefinitely. I don’t think anything is more impaired with dentures than the experience of eating. Food needs to be chewed an average of 6-7 times more than with natural teeth, in order to swallow. And strength of chewing is reduced to about a quarter of that of natural teeth. Not only is chewing a whole new challenge, certain foods sometimes cannot be eaten at all. Food that may require more of a tearing and shredding action that teeth can provide are not able to be broken down at all with denture teeth. What immediately comes to mind? Protein maybe? How impactful is the decrease of protein (specifically if animal protein is a part of your normal diet) on your overall nutrition? Then there is the most pleasurable part of eating. TASTE! 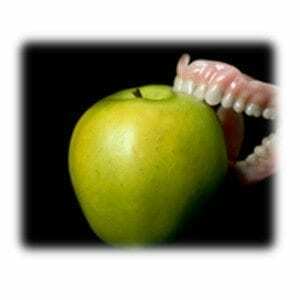 More times than not, a person’s sense of taste is changed and made dull when wearing dentures. In attempts to gain more flavor when eating, people seek out foods with higher sugar, fat, and salt contents, resulting in further health problems associated with weight gain. Being without your natural teeth may impact sleep, as there are increased incidences of sleep apnea. There is some speculation as to whether or not denture plaque and bacteria (that are more populated beneath an upper denture plate) may be related to aspiration pneumonia. In all fairness, this may not be the case for every single person. You may have a friend who is absolutely delighted with her new, straighter and brighter smile. Maybe she really hasn’t experienced any of these negative effects. That’s wonderful! I do want to be clear that dentures are in fact a miracle for patients who would otherwise be without teeth. Dentures can literally turn the lives around of those suffering from edentulism, and I’ve seen this time and time again in our office. However, it is not recommended to pull teeth that can be saved to have a denture placed. This can seem like the easiest option, and it can be very disappointing. 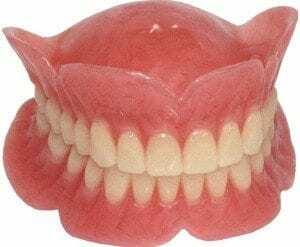 Given my exposure to patients with dentures, I have encountered a great number of people who are very regretful for not intervening in their dental health earlier in life, so that this option could have been avoided. Ultimately, the message that I am trying to convey here is this; take care of your teeth and gums and they will take care of you. Nothing is better functionally than your own healthy, natural teeth. Success can be yours with effective plaque removal (we strongly recommend the use of a Sonicare and Waterpik) along with regular visits to your dentist. Staying committed to regular dental exams (twice a year) can provide early diagnosis so that resolution can be more conservative (and usually less expensive). Investing in the health of your mouth will pay dividends later in life. Here at Metropolitan Dental Care it is my #1 priority to help our patients have a long term plan to keep their teeth for the duration of their long lives.